The GeekVape Aegis is a powerful and incredible TC Kit with strong waterproof, shockproof and dust-proof design by adopting advanced LSR Injection Moulding technology. Consisting of excellent Aegis 100W TC Box MOD and new Shield Tank, the GeekVape Aegis 100W TC Kit will bring you an unbelievably amazing vaping. The GeekVape Aegis TC Kit is a durable and strong vaping device with advanced waterproof, shockproof and dust-proof design by adopting advanced LSR Injection Moulding technology. The GeekVape Aegis kit comes with Aegis 100W TC Box MOD and 4ml Shield Tank designed by Justin, Geekvape GM, offering you an excellent vaping. Moreover, Aegis 100W MOD supports almost all major battery cells on the market such as 18650 or 26650 battery even 20700 and 21700 battery with a thinner cap. Together with a most advanced chip featuring the real rated power and instantaneous firing (0.015 seconds), GeekVape Aegis 100W will bring you an extremely powerful vaping. 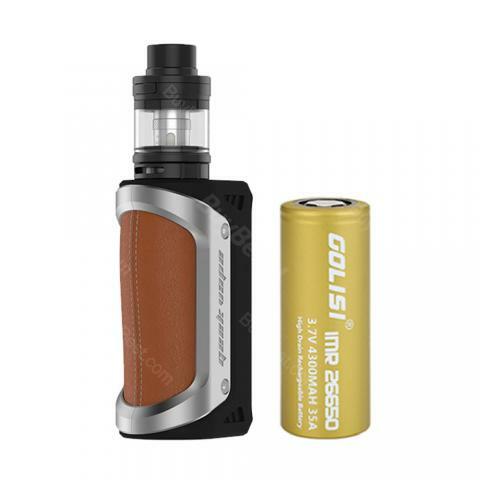 Perfectly paired with 4ml Shield Tank which features flavorful bottom airflow and quick access refill system, the GeekVape Aegis 100W TC Kit is absolutely a long-term used powerful vaping device. • You can select Aegis MOD, Shield Tank and Mi/M4 Replacement Coil. • We provide Aegis Battery Cap to compatible with 20700/21700 cells. • You can download CE, RoHS, FCC and Drop Test certificates. • Attention: Although this device is designed to be waterproof and shockproof, please DO NOT expose it into water or damage it on purpose. • The micro USB of the device is only used for firmware upgrade, not for charging. • Please upgrade your Aegis to the latest firmware for better vaping experience. You can find the firmware at http://www.geekvape.com/download/ (Geek Vape Firmware Update Section). • The replacement IM1/IM4 Coils are also available in HG. And The SMOK TFV8 Big Baby/ Baby Series Coils(Standard Version) also can be used in Shield tank. I am very surprised about the waterproof and shockproof. Good job! I have got the kit in a short time, amazing. I am glad to get such a good device. Dropping it on the ground, having it knocked out of my hand, and just plain bad luck. I can use the Aegis MOD for months. The Aegis TC is amazing! Also, good customer service and fast shipping! Nice! Good Aegis TC mod!